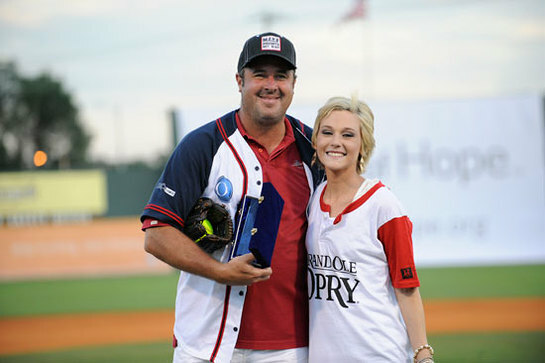 Vince Gill, Dierks Bentley and David Nail will join a star-studded roster of country music’s hottest performers, sports personalities and more to help strike out cancer and other life-threatening diseases at City of Hope's 21st annual Celebrity Softball Challenge, on Saturday, June 11, at 9 a.m. at Greer Stadium in Nashville, Tenn.
For the first time in the game’s history, two City of Hope supporters will hang out in the dugout, and get into the game, with Nashville’s stars through the “Connected to Hope Celebrity Softball Challenge” contest. Visit www.cityofhope.org/connected to learn more and enter. An official part of the CMA Music Festival, this year’s game marks the 21st year that Nashville’s power hitters have gone to bat for City of Hope, a leading research, treatment and education institution for cancer, diabetes and other life-threatening diseases. The Celebrity Softball Challenge has raised more than $2 million for City of Hope, enabling scientists to advance research and improve treatments for patients everywhere. In addition to Vince Gill, Dierks Bentley and David Nail, Brett Eldredge, Chuck Wicks, Jake Owen, James Wesley, Josh Gracin and Point of Grace will take the field for the highly anticipated game between longtime rivals Grand Ole Opry and After MidNite with Blair Garner. Additional celebrity players will soon be announced. This year, City of Hope is offering two lucky winners the once-in-a-lifetime chance to become “draft picks” for the Grand Ole Opry and After MidNite with Blair Garner teams by entering the “Connected to Hope Celebrity Softball Challenge” contest and sharing their story of how they are connected to City of Hope. “Connected to Hope” stories can be based on a personal connection to, or treatment at, City of Hope; a connection via research and therapies developed at City of Hope and in use worldwide; or an emotional connection to City of Hope’s mission to prevent and cure devastating illnesses. City of Hope patient Nichole Schulz presented Vince Gill with the Ambassador of Hope Award. City of Hope patient Nicole Schulz with Vince Gill. Through May 27, entrants can visit the “Connected to Hope Celebrity Softball Challenge” contest page at www.cityofhope.org/connected and tell City of Hope, in 500 words or less, how they or a loved one have been “Connected to Hope” in some way. Two “draft picks” will be selected to join City of Hope’s celebrity softball teams and get connected to Nashville’s hottest music stars in the dugout on June 11. 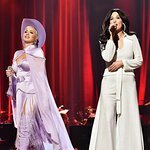 Each winner and a guest will also receive tickets for CMA Music Festival’s nightly concerts at LP Field on Friday (June 10) and Saturday (June 11) in Nashville, including round-trip airfare and accommodations. The physicians and researchers at City of Hope strive to shorten the time from initial research idea to new treatment to quickly bring cures to patients. This research is making a difference in the lives of people everywhere, connecting millions to City of Hope. Numerous breakthrough cancer drugs, including Herceptin, Rituxan and Avastin, are based on technology pioneered by City of Hope. Millions of people with diabetes worldwide benefit from synthetic human insulin developed through research conducted at City of Hope. A pioneer in bone marrow transplantation, the center has performed more than 10,000 transplants, the second institution in the nation to achieve this milestone, and now operates one of the largest, most successful programs of its kind in the world. City of Hope’s Department of Supportive Care Medicine and its integrated, 360-degree approach to healing through services such as art and music therapy, yoga and support groups, serves as a model for other centers worldwide. This year’s event sponsors are PEOPLE Country as the presenting media sponsor, Staples, Humana and Carhartt, among others. 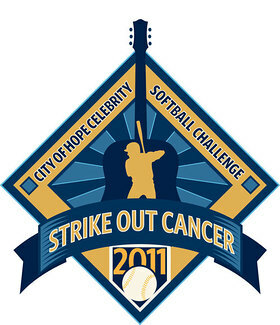 For more information on the 21st annual City of Hope Celebrity Softball Challenge, please visit www.cityofhope.org/giving/fundraising-events/softball. To purchase tickets to the most fun-filled game in town, visit www.ticketmaster.com. All ticket sales benefit City of Hope.